Twitter can be really good to me sometimes. 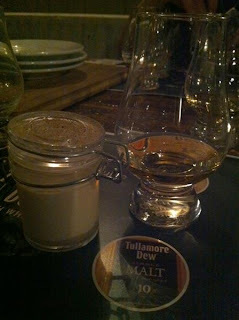 Last week, I saw a tweet from Stoneybatter gastropub, L. Mulligan Grocer, offering places at a whiskey tasting where Tullamore Dew whiskey would be paired with specially made desserts from the L. Mulligan team. Best of all, places were free! One email later and I had secured two places at the event. 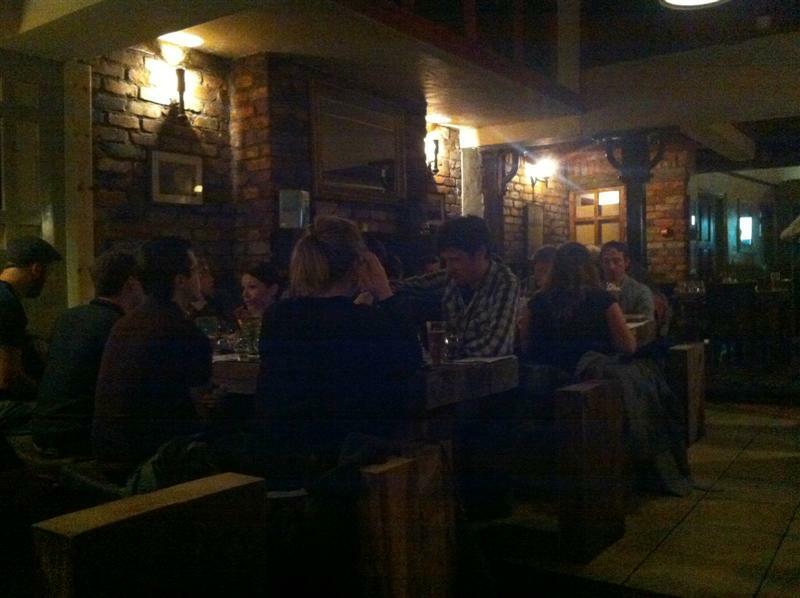 The tasting was scheduled to commence at 8pm sharp, and attendance was high, with the dining area at L. Mulligan packed out by freeloaders whiskey fans, keen to get their hands on some free whiskey and tasty desserts. Every place was set with 4 whiskey glasses, each containing a small sample of some Tullamore Dew brands. 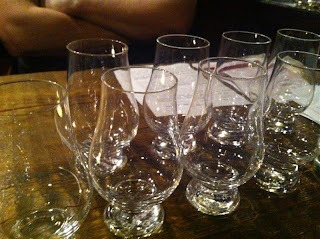 Alongside was a description of the desserts to be paired with each whiskey and some pointers on flavours. Our two tasting guides from Tullamore Dew introduced themselves and the show got underway. 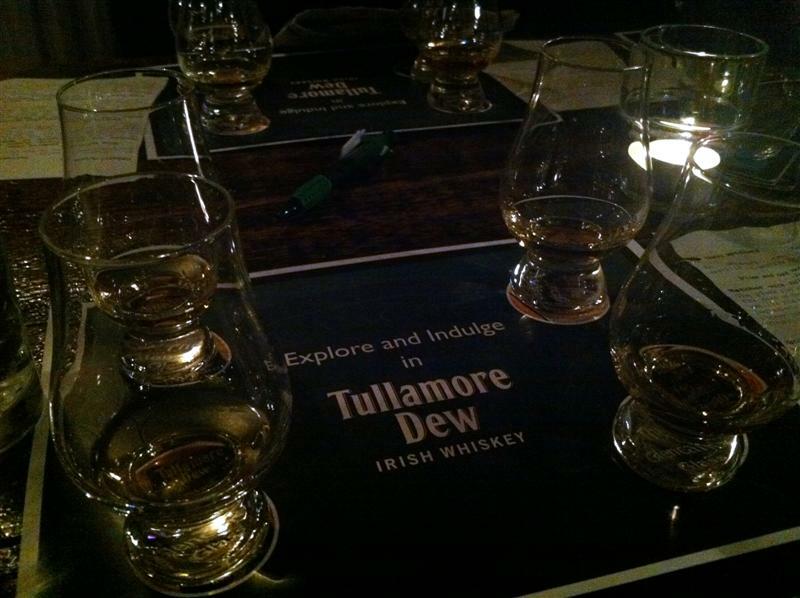 We started with the standard Tullamore Dew Original whiskey. This was not paired with a dessert as it was simply meant to get us ready for the treats to come. I was pleasantly surpised by this whiskey, being light and smooth, with sweet and citrus flavours. A very drinkable everyday whiskey. The first dessert pairing came courtesy of Tullamore Dew 12 Year Old Special Reserve and a plum & oat madeira cake with orange drizzle icing and ginger pouring cream. 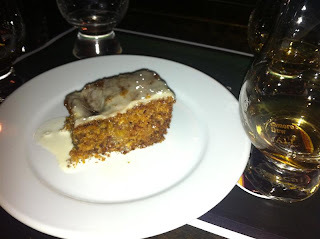 This was my favourite pairing of the night as I thought that the sweet almond and vanilla tones of the whiskey matched the cake beautifully, while the whiskey's spicy tones were complemented by the warmth from the delectable ginger pouring cream. Next, vanilla and orange zest spiced mousse served in an adorably tiny little jar was paired with Tullamore Dew 10 Year Old Single Malt. The vanilla and long citrus finish of this single distillery whiskey reminded the Mulliganers of Milky Way bars and orangette, leading them to create this zesty mousse. Although I thought the mousse reminded me of my 80's childhood favourite, Angel Delight, it did pair well with the malt whiskey, as the two nicely rounded off each others corners. I found the the Tullamore Dew 10 Year Old Malt to be a very aromatic whiskey with lovely sherry aromas. The Tullamore Dew team explained that this arose from the long aging process whereby the whiskey is moved between Bourbon, Dry Oloroso Sherry, Madeira and Port casks. Phew - that's a lot of effort! 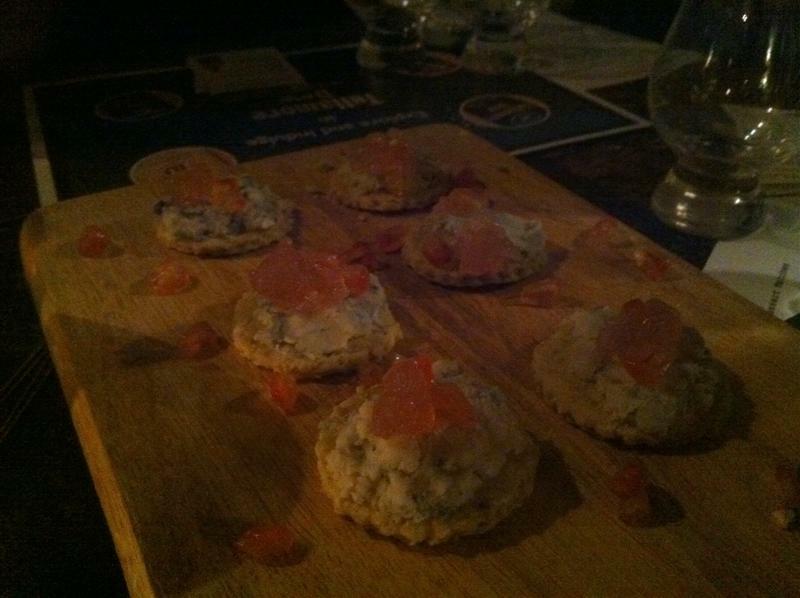 The last of our pairings consisted of Boyne Valley blue cheese, served with oatcakes, apple & grapefruit jelly and pomegranate seeds, paired with Tullamore Dew Year Old 10 Reserve. This was the least favourite of the pairings, as I found the whiskey to clash with this strong blue goat's cheese, causing an unwelcome sharp flavour in my mouth. Later, we were told that the original pairing was to involve Mossfield Organic, a Gouda-style cheddar, which I think would have worked much better. The tasting session finished up with a cocktail making challenge. Each table, or group, was given a cocktail shaker, a shot of whikey and a cocktail recipe. We drew a Chocolate Orange Old Fashioned, a challenge for which I felt adequately qualified. Thanks to the fabulous mixologist at Cliff Town House, I'm an expert in Chocolate Orange Old Fashioneds, so I set about the challenge with some gusto. And the best part - we won the challenge, receiving a gift card to spend at the bar later. Unfortunatley, I was the designated driver for the night, so I was truly only "tasting" the whiskies and cocktail. Himself was the main beneficiary of the night, as he received all my whiskey surplus. However, I've got to admit that I kept all the desserts for myself! Somethings you can't share. Overall we had a great night. I really can't recollect drinking Tullamore Dew in the past - iI'd go so far as to say that I had it confused with Irish Mist in my head. In fact, Tullamore Dew is a long established brand, being in existence since 1829, and is very popular abroad. It actually ranks as the No 2 whiskey in Eastern Europe. Other interesting facts learned on the night include that the use of the word "dew" in the title is not an effort at lyricism, but instead arises from the initials of a manager in the early years of the distillery, a certain Mr. Daniel E. Williams. L. Mulligan Grocer will be running similar events in future, so keep an eye out for future dates via their blog, Twitter, or get added to their mailing list. I must say, you really needed a driver who was not taking part. Otherwise, that is just cruel. I LOVE old fashions - an congrats to you for winning. What a wonderful event Joanne. I can tell from the way you wrote this piece that the evening was just great. When we had our restaurant in the US we served Tullamore Dew A LOT because it came in these beautiful ceramic bottles and our customers always wanted to take them home.....and use them as flower vases etc. It is a wonderful product and we should drink more of it ourselves - but are stuck in a Crested ten rut here :0) How lucky for you guys to be able to go to events like this - for free. Green with envy I am. As a Tullamore girl I'm delighted you liked it! !